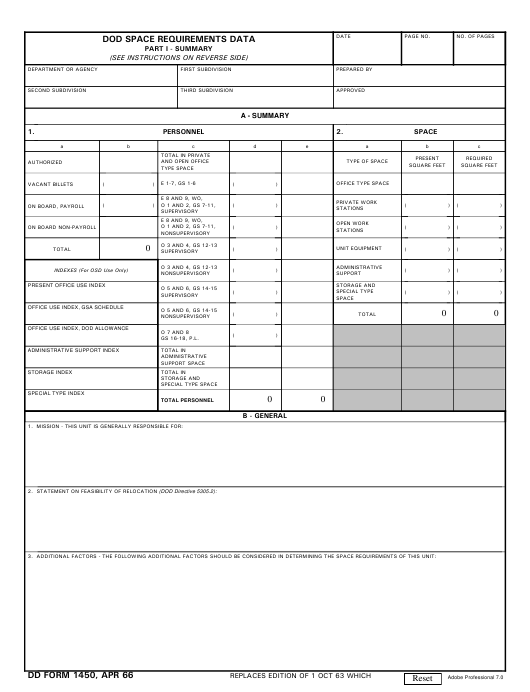 DD Form 1450 or the "Dod Space Requirements Data" is a Department of Defense-issued form used by and within the United States Army. The form - often mistakenly referred to as the DA form 1450 - was last revised on April 1, 1966. Download an up-to-date fillable PDF version of the DD 1450 down below or find it on the Department of Defense documentation website. determine new space requirements or to analyze present space utilization. requirements listed on all of the Part II's. or rank of the incumbent. reverse side of the form. equipment", and "administrative support space", defined below. or, in some instances, by a principal and his secretary. from actual measurements or by using the items below as a guide. equipment required for their work, plus circulation space. necessary for performing his work, plus a share of the adjacent aisle. not used exclusively by one individual. rooms, supply rooms, libraries (except fixed stacks), etc. basement areas, as well as space built for warehousing and records storage. numbered consecutively to include all DD Forms 1450 and 1450-1 submitted. a. Personnel. Complete columns b and d, leaving column e blank. In column b, the sum of "Vacant Billets" and "On Board, Payroll"
Non-Payroll" personnel shown in column b.